We’re committed to providing the highest quality Dubia roaches and the best service on the Internet. We would love your business. Here are some of the things we do to earn it. We sell only high quality Dubia roaches, raised on a mix of mostly whole, all-natural, human-grade food ingredients from local farmers and distributors. We’ve had remarkable success with our premium roach chow, which we developed (and continue developing) with significant testing over time. Our philosophy is that healthy roaches are productive roaches, and we take great care to maximize the health and productivity of our stock. In fact, when it comes to Dubia roach production, we believe nutrition is paramount. And science backs this up. Proper nutrition is an established foundation for insect growth and production. And, for those who buy Dubia roaches as feeders, superior nutrition increases their nutritional value. We developed our Dubia feed over many roach generations in part to create the most nutritious feeders possible for our animals. After lots of experimentation and testing, we’ve ended up with a remarkably high quality roach food that produces exceptionally healthy, nutritious roaches. Because our Dubia are born and raised on high quality foods, they are suitable for feeding to your animals right out of the box. We recommend gut loading Dubia feeders, but you need never wonder whether or not our roaches were well cared for. You also don’t need to worry about what’s in their gut. We increase our bottom line by boosting growth and production through superior health, not by factory-style production or cheap bulk feed. In short, healthy Dubia roaches are what we do, and nutrition is how we do it. 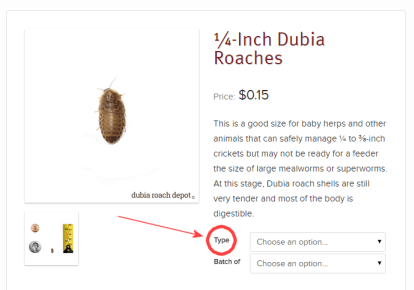 In addition to our standard fare, we also offer organic Dubia roaches because we’re serious about herp nutrition. Pesticides are bad for people and insects, and it follows that they’re probably not good for amphibians, arachnids, and reptiles either. Organic Dubia roaches are definitely “next level” feeders. They’re a bit of a luxury, and they aren’t necessary or even practical in many situations. Some of the concern when buying standard roaches can be eliminated by feeding them organic food for a few days prior to feeding them off to your animals. When this is not possible, be particularly careful with the so-called “dirty dozen” foods (external link). At a minimum, always thoroughly wash any produce you offer to feeder insects, including Dubia. The bottom line is that all of our roaches get the very best care. We would feed them all organic foods if we could, but it gets expensive so we have to draw a line between organic and non-organic. Our services include same day shipping and free shipping. We’re also available to answer any questions you may have. With us there’s no waiting around for your order to ship. Orders placed by 3 PM Pacific Time (6 PM Eastern) on regular shipping days ship the same day they’re placed. Orders placed after 3 PM may ship that day, but we can’t promise they will. It depends on things that change by day, month, season, etc. If we receive your order after the cut-off and we can get it out that day, we certainly will. NOTE: USPS Express (Overnight) has an earlier cut-off time than the other services, so we need to receive your order by noon PST to get it out that day. We’ll try to get overnight orders placed after noon in the mail that day, but the later we receive them, the less likely that becomes. Most orders received by 6 PM EST (3 PM Pacific) will ship the same day they’re placed. Orders shipped USPS Express (overnight) should be placed by noon for same-day shipping. We will post changes (such as holidays or extreme weather) on our website. *Orange – orders ship same-day at our discretion. The main issue is temperature and no USPS delivery on Sundays. We may delay shipping if we are aware of conditions that are likely to impact the health of the roaches. Our shipping policies are designed to avoid situations where insects are left unattended (like Sundays or holidays) in extreme temperatures (like the dead of winter). However, we will ship your order on a non-shipping day by request, if possible. To make a request, write “Friday shipping OK” (for example) in the message box on the checkout page. Please note that requesting shipping on non-shipping days could be risky, so we can’t guarantee live arrival if you do. All orders over $45 are eligible for free shipping via USPS First-Class Mail. We also offer expedited shipping via USPS Priority Mail and FedEx. Our Service Guarantees include our Live Arrival Guarantee and Complete Satisfaction Guarantee. These come with conditions and limitations, which are detailed below. We guarantee that the roaches you order from us will arrive alive when each of the Conditions below are met and subject to the Details and Limitations that follow. Though we do not guarantee live arrival when the following conditions are not met, we encourage anyone with a live arrival issue to contact us and describe the situation. We want all our customers to be happy and we may be able to work something out, depending on the circumstances. Temperature: Your local temperature must be between 40° F and 90° F, as must the temperature en route. We do not guarantee live arrival when the temperature falls below 40° F or rises above 90° F at any time while the package is in transit either (a) in the delivery zip code, or (b) at any location listed in the package tracking history. While heat and cold packs are usually effective at keeping insects alive during shipment in extreme temperatures, they do not eliminate risk and are not a guarantee against loss. Delivery: The package must be accepted. Refusing delivery will void our Live Arrival Guarantee. Regular Shipping Days: The package must be shipped on a regular shipping day, or on a non-regular shipping day our discretion. Packages shipped on non-regular shipping days at the customer’s request are not covered by our Live Arrival Guarantee. Documentation: The condition of the roaches at the time of arrival must be clearly documented with video or digital photographs. These must be emailed to us within two hours of the arrival time indicated by the carrier’s tracking system. Details and Limitations: If the Conditions above are met, we will issue a credit at our discretion for the value of the dead roaches. Shipping costs are final and non-refundable. They are not guaranteed, credited, or refunded. Email your video or photographs and a description of the situation along with your name and order details. We will reply shortly. We want to be the number one supplier of Dubia roaches online, so we work hard to get and keep your business. We think that comes through in the quality of our roaches and the service we offer our customers. If there is ever a problem with an order, contact us and we’ll see what we can do to fix it. Each order comes with the following guarantee: If you are unhappy with your purchase for any reason, you may return it to us in original condition for a refund, minus the cost of shipping. This is our Complete Satisfaction Guarantee, and it even extends to Dubia roaches. Within a reasonable time, you may return live roaches that you bought from us for a pro-rated refund. If you buy 50 Dubia roaches, for example, and decide you want to return them after feeding 25 to your animals, you may send the 25 back to us and we may refund up to half the cost of the roaches. To return live roaches, please follow the return instructions below. To return items you’re unhappy with, including roaches and partial orders, contact us via email. Identify your order by order number or name and date, describe (a) what you want to return and (b) the condition of the item(s) to be returned, and wait for a reply from us. Please don’t ship anything before receiving instructions. Below are answers to common questions about our products and services. Please contact us via our online contact page or email if your question isn’t answered here. My roaches arrived and they aren’t moving. What should I do? See our live arrival guarantee instructions and contact us right away. Then set the roaches aside in a warm area for an hour and see what happens. As strange as it sounds, they may come back to life. Insects – even tropical ones – sometime survive extreme temperatures. Yes, but only to those with a state-issued permit. Otherwise, shipping Dubia Roaches to Florida is illegal. Contact us if you have a permit and would like to place an order. Do you give your Dubia roaches any supplements? No. We give them a well-balanced diet. All the vitamins and minerals they need are in the grains, fruits, and vegetables they eat. If you want your animals to get extra vitamins like Vitamin A or minerals like calcium, you should gutload or dust with a vitamin or mineral powder. My order isn’t here and tracking says “delivered”. What should I do? First check to see if the package was left in an unusual place, or if your neighbors may have picked it up by accident. Then contact the carrier. They can often figure out if they made an error. Yes. Although death during transit is uncommon, we overstock all roach orders by about 10% just in case. Why are Dubia roaches so expensive? It’s a supply and demand issue. They’re expensive compared to other feeder insects right now but we’re working to change that. Not at this time. It seems that the process is long and involves permitting and lengthy quarantines. I see Dubia roaches that are different colors. Are they the same? Dubia roach color varies between all black and black/orange. They are all essentially the same. Environmental condition, natural variation, and age may all impact their color. Color is not an indication of quality. What’s the chance an order will ship on Thursday or Friday? In summer, Thursdays are usually OK and Fridays are mostly OK. Winter is when temperature really becomes an issue. Dubia roaches can handle some heat but not freezing temperatures. Yes. We ship via USPS Priority Mail to PO Boxes. Because we are shipping live animals, we strongly recommend asking the PO box provider what time the US Postal Service delivers each day, then picking up the package as it arrives or shortly after. Shipping and handling is free for orders over $35 shipped within the continental US. The cost of standard shipping for orders under $35 varies by location. Shipping to a PO Box requires USPS Priority Mail and the rate is based on the weight of the package as well as the location to which you are shipping. Expedited shipping rates are based on the location to which you are shipping. We will send you an email when your order ships. This email contains package tracking information. What do I do if there is a mistake in my order? Contact us either through our online contact form or by email. No. While a US territory, Puerto Rico has its own customs and import regulations that restrict non-native plants and animals. Do any of the cockroaches you sell bite? Yes and no. Hungry Dubia roaches may “scratch” at skin they mistake for food, but they usually run away when they realize it’s not. Larger cockroaches like the Flat Horned Hisser may attempt to bite while being handled if they are sufficiently frightened and cannot escape, but in our experience their mouths are too small to grab hold, and getting them used to handling usually solves this issue.